A popular canyoning descender, the Pirana provides three initial friction settings along with simple techniques for adding friction while abseiling. The Petzl Pirana is a popular canyoning descender, particularly in Europe. It is one of a family of advanced Figure 8 style descenders that use horns to provide additional friction settings. It is quick and easy to get on and off rope. The device can be rigged with one of three initial friction settings — slow, medium, or fast — when attaching to the rope. Once abseiling it is then possible to add further friction using the horns. It can also be locked off quickly, easily, and securely when needed. 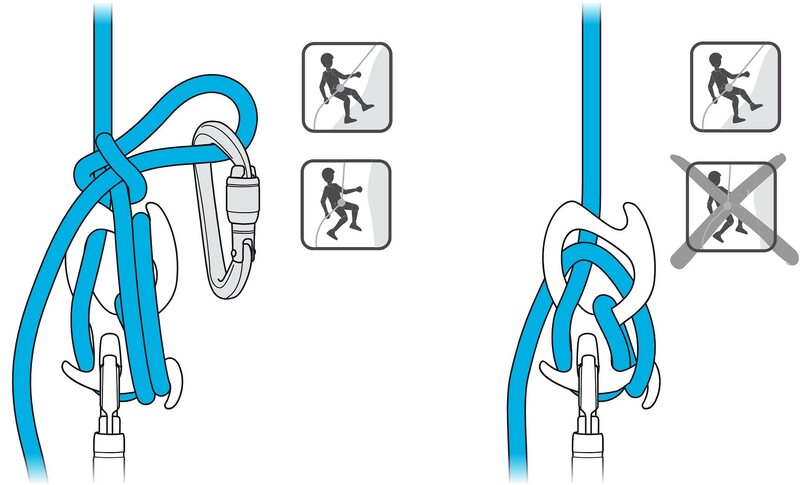 Petzl recommend that the Pirana be used with a dedicated round style HMS carabiner. The small hole and plastic insert hold the ‘biner firmly in place, reducing the risk of cross loading. This firm fit also keeps the device firmly attached when getting on and off rope to prevent it being dropped. The design of the Pirana prevents the formation of a girth hitch, which can form with traditional Figure 8 devices. The unique shape also reduces rope twist. The image below indicates the three friction settings that can be set before abseiling, along the the recommended ways of utilising the horns to add friction during descent. There are several ways to lock off the device which depend on the situation. For a temporary stop, the rope can be wrapped twice around the horns, however the brake hand must remain on the rope. The below image shows two techniques for a longer tie-off where you wish to have both hands free. The first is a continuation of the temporary stop, with the addition of a releasable knot. This is recommended when free hanging as the simple tie-off on the right can be difficult to undo. This is a really smart descender designed specifically for canyoning. The unique tail allows quick and easy adjustment to friction levels while on rope. Designed specifically for canyons, the No.Mad is a figure-8 style descender with three different friction settings that can be added to while abseiling.